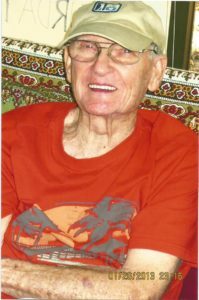 Francis Dillman Griffin passed away on Aug 17th, 2018. He was born October 25th, 1927 in Bethune, South Carolina to Robert A. Griffin and Frances S Griffin. He was married to Charlotte H. Griffin for over 63 years until her passing on Dec 27th, 2012. Frank and family moved to Merritt Island in 1965, where they became active members of the First Baptist Church of Merritt Island. He became an integral part of the Church’s special events like the Living Christmas Tree, Easter Pageant and many others, acting as their Set Designer as well as designing and constructing many other projects throughout the Church property. He also played the Trumpet in the Church Orchestra and taught special needs children with Charlotte. Among his many life accomplishments, Frank served in the Navy for 3 ½ years being Honorably Discharged and then went to Georgia Tech graduating with a Design Electrical Engineering Degree. Frank then went to work with NASA where he had a successful career and Two Patents, and after 24 years of service retired as Chief of the Launch Control Systems Branch. In Frank’s retirement days he enjoyed doing projects for the Church, painting Murals, Loved to Golf and mostly Loved to play the Trumpet. Frank is survived by his sons Michael, Steven and Charles. His Grandchildren, Marisa, Allyson and Kelly and Great-grandchildren Dannikah, Leslie and Merrick as well as many other loving family members. Frank had many close friends, and colleagues. Thank you to all who were a part of his remarkable life. Calling hours will be held on Saturday October 20th, 2018 from 1:00 – 2:30pm, at First Baptist Church of Merritt Island, 140 Magnolia Ave, Merritt Island, FL, 32952. The Memorial Service will be at 2:30pm, with a reception at the church immediately following. In lieu of flowers donations may be made to The House of Hope in care of: The First Baptist Church of Merritt Island. Mr. Griffin was a great part of our church family when I was a little girl. So sorry for your loss. My condolences are with the family. We are so sorry for the loss of the last original Griffin brother. I will never forget his irrepressible humor, creativity, and love of life. I always will recall his Quixotic challenge of trying to fly a kite on a windless day because the grandchildren so wanted to see it soar. And, to me, his greatest trumpet solo: Taps at my father’s (his brother) memorial service. Like so many, we are sad, but feel lucky to have and him in our lives. Donations may be made to The House of Hope in care of: The First Baptist Church of Merritt Island. Frank Griffin’s Video Memorial Available on DVD.